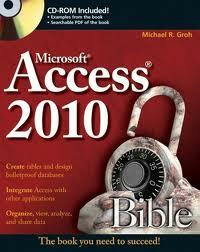 There are hundreds of books for Microsoft Access, SQL Server, Visual Studio.NET, and Visual Basic. How do you choose what's right for you? FMS is pleased to recommend some books we think will help you become a better developer. These are books written by people we know (including us!) who are experienced developers. These are not just books based on the help file or written by professional writers. These books are written by authors who experience the same problems we all face every day. Their insight will save you lots of time and help you become an expert. As an added convenience, we have teamed up with Amazon.com so you can order these books directly by clicking on the "Buy From Amazon.com" links. Written by our friend Teresa who is an Access MVP and president of the Pacific Northwest Access Developer Group and the Seattle Access Group. She is the lead author of the Access VBA Programmer's Reference series and is a lead on three national committees for INETA. Her company, Data Dynamics Northwest, provides data management solutions and consulting services. Teresa's book shows how to take control with database models developed by a team of leading Microsoft Access MVPs that provide ready-to-use solutions for sales, marketing, customer management and other key business activities for most small businesses. As the most popular relational database in the world, Microsoft Access is widely used by small business owners. This book responds to the growing need for resources that help business managers and end users design and build effective Access database solutions for specific business functions. This is a complete guide on the latest tools and techniques for building Access 2013 applications for both the web and the desktop so that developers and businesses can move forward with confidence. Whether you want to expand your expertise with Client/Server deployments or start developing web apps, you will want this book as a companion and reference. Therea starts with the fundamentals of the new Access 2013 web app and then takes you step by step through building a robust application. Examples and techniques are provided to create and deploy professional solutions for both traditional and web applications. It demonstrates how to automate other programs using macros, VBA, API calls, and more. Techniques are shared for using macros to create solutions that will run in a web browser and perform tasks on SQL Server®. Special emphasis is placed on creating cost-effective solutions based on real-work scenarios. 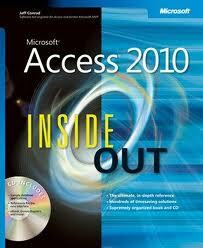 Friendly, direct, and patient, this book reveals Access 2013's power, and helps you quickly master its updated interface. World-renowned Access tutorial author Alison Balter provides step-by-step instructions for every task requiring more than one step. She presents screenshots guiding you through complex processes, and illustrations demonstrating the touch gestures you need to run Access on the latest tablets and Windows 8 devices. Along the way, she covers key Access 2013 improvements that make it easier to build web-based apps and SharePoint-integrated database solutions that are consistent, manageable, flexible, and exceptionally usable. Another great book written by Teresa. 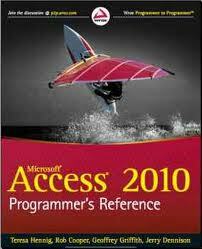 This is a comprehensive guide to programming for Access 2010 and 2007. With in-depth coverage of VBA, macros, and other programming methods for building Access applications, this book also provides real-world code examples to demonstrate each topic. 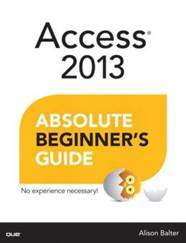 Access 2010 Programmer's References a comprehensive guide to the best-of-breed techniques for programming Access applications. Written by our dear friend Alison who is a well known writer, presenter, and trainer in the Access community, these books target power users and beginning developers. They're great for getting you up-to-speed immediately so you can use Access more productively. Alison's book takes a highly technical topic and presents it in a manner that is easy to comprehend. You'll want to read it from cover to cover, but it can also act as an excellent reference. Learn thorough knowledge of Access application development, real-world solutions to specific development and programming problems, and professional programming techniques backed by concise, no-nonsense explanations of the underlying theories. Debugging and troubleshooting methods are also included. An authoritative guide to mastering the essential facets of Access's powerful 32-bit development platform. Detailed, step-by-step instructions guide the reader through the process of designing and using Access tables, queries, forms, and reports. Chapters on VBA techniques pave the reader's way to Access programming. This book shows you how to take control of Access using VBA. You’ll learn to create and name variables, use DAO and ADO to manipulate data, handle errors correctly, create classes and use APIs, and more. An entire chapter is devoted to the changes in Access, including new wizards and GUI features that previously required VBA code as well as new VBA features. You will discover how to access data with VBA, execute and debug VBA code, and use VBA with Access objects. Finally, you will learn more about the relationship between Access and SQL Server, and how to use VBA in Access to control and enhance other Office applications. Our friend Zac Woodall is a Program Manager and lead developer on the Microsoft Access development team. In this book, he shares his experience and provides templates to create tracking applications incorporating the rich user interface of MS Access. In particular, the design, creation and sharing of Access templates. Topics include customization, personalization, branding, and working with SharePoint. Advanced topics include template file anatomy, template collections, enterprise templates, generating templates without running Access, and integrating templates with add-ins. The book includes sample code, sample templates, and a bonus chapter on how to install and use .accfl field template XML files to customize the Access Field Templates task pane. Learn from one of the best Access experts. This book focuses on issues that help protect your database. Written from an experienced developer's point of view, the author discusses protection and security task-by-task. This book is even recommended among Microsoft TechNet Security Topics: Threats and Countermeasures. You will learn to hide tables as system tables, produce databases difficult to crack, and back up databases. You will learn how to keep staff from viewing salary tables, prevent customers from peeking at your distributed software design, and become a better judge of worthwhile security options (versus time-consuming choices). Microsoft Access Developer's Guide to Microsoft SQL Server provides much needed information and guidance for the Access power user or developer who wants to exploit the power of SQL Server. Written by Access experts and Microsoft MVPs Mary Chipman and Andy Baron, this hands-on guide provides you with the practical knowledge you need to harness the enterprise-level power and scalability SQL Server offers, while using the Access tools you are familiar with. More than just a migration guide, you will benefit from the authors' expert discussions of topics including the new Microsoft Database Engine (MSDE), Transact SQL, building stored procedures and views, converting your applications to SQL Server, working with SQL Server security, and building Access interfaces to SQL Server databases. This perennial favorite was completely rewritten by our dear friend Michael Groh for Access 2007. Michael is the former editor of Access Advisor and has a wealth of experience developing Access applications, along with his coauthors. These books offer step by step instructions and practical examples and advice that equips you with everything you need to know to organize, present, analyze, and share data on a network. CD-ROM included. A comprehensive reference that takes readers through the most used tasks and functions of the software. Easy to use, the book has a friendly, open design that features copious screen shots, call-outs, cross-references, and tips. Here's the book FMS recommends for anyone who wants to be a serious Access Developer. It includes the tips and techniques necessary for being an advanced Access developer. We know Paul, Ken, and Mike personally and can vouch for their knowledge of developing sophisticated Access applications. Get their expertise for a fraction of the price you would have to pay to hire them as consultants. This must read book is packed with tips, tricks, secrets, undocumented features, and tons of reusable source code. This indispensable guide is your ticket to developing bulletproof applications. Learn how to build more efficient databases, design better user interfaces, develop client/server applications, and plan for interoperability. The companion CD includes all examples from the book, a library of reusable code, ready-to-use subroutines and user interface objects, and great freeware and shareware utilities. Developers will want to sit by their computers with this edition--the best available and most comprehensive. It is packed with reusable code, advanced techniques, and insider tips from the leading Access experts. The CD includes all examples from the book including the databases, a code base of reusable code, and subroutines and user-interface objects ready for immediate use. If you are serious about being an Access developer, you need to read these books. Without them, you'll waste countless hours trying to do things you can look up. Discover how to create databases the Access way. Your life will be a lot simpler if you know how. This is the official technical reference on Microsoft Jet, the powerful database engine used in Microsoft Access and Microsoft Visual Basic. If you write code that creates and manipulates a database in one of these products, you can easily use that same code in the other, or use both products together to create custom database applications. You'll learn what Jet is, how to use it, and how it compares to other database engines. Each chapter includes a simple Visual Basic program that is built upon to illustrate points throughout the discussion. Microsoft SQL Server Unleashed offers a variety of topics for system and database administrators to help them learn new features of the product and to solve problems they face on a daily basis. It shows them how to build upon their working knowledge of the product and take their experience and knowledge to a higher level. This new edition of Microsoft SQL Server Unleashed covers the latest updates and service packs to SQL Server 2000 or 2005, including full support for XML, notification services, and SQL Server CE. In addition to providing a thorough treatment of SQL Server 2000 development, Rob Vieira's extensive reference also devotes quite a lot of space to covering SQL in general and issues relating to database design. Included is a complete introduction to Transact-SQL and an excellent chapter on normalization that will help demystify an over-referenced but much misunderstood database design concept. There is also in-depth information on the new features of SQL Server 2000, including indexed views, user-defined functions, and support of XML. This core reference demonstrates how to use ActiveX Data Objects.NET (ADO.NET) to access, sort, and manipulate data in enterprise-wide, Web-enabled applications. Readers learn best practices for writing, testing, and debugging database application code using the new tools and wizards in Microsoft Visual Studio .NET-with code on a companion CD, plus insider tips. The book also describes the ADO .NET object model, its XML features for Web extensibility, integration with Microsoft SQL Server 2000, and more. If you want to use Visio to create enterprise software, this is the book for you. The integration of Visual Studio .NET Enterprise Architect and Visio for Enterprise Architects provides a formidable combination. Visio offers powerful diagramming capabilities, including such things as creating UML models, mapping out databases with Entity Relationship diagrams, and aiding the development of distributed systems. Its integration with Visual Studio .NET Enterprise Architect means that C# or Visual Basic .NET code can be generated from the UML diagrams, and Visual Studio .NET projects can be reverse engineered to UML models. For the developer already familiar with UML and looking to get the best out of Visio, the Visual Studio .NET and Visio for Enterprise Architects combination is weakly documented, and the quality information needed to realize the time-saving features of Visio just doesn't seem to be available, until now. This book presumes that you are already familiar with the basic concepts of UML notation - this book will not teach you UML. Instead, this book will take you forward into the Visio environment, showing you how to make the most of its software-related features. Besides an introduction to refactoring, this handbook provides a catalog of dozens of tips for improving code. The best thing about Refactoring is its remarkably clear presentation, along with excellent nuts-and-bolts advice, from object expert Martin Fowler. The author is also an authority on software patterns and UML, and this experience helps make this a better book, one that should be immediately accessible to any intermediate or advanced object-oriented developer. Microsoft's Shared Source CLI (code-named "Rotor") is the publicly available implementation of the ECMA Common Language Infrastructure (CLI) and the ECMA C# language specification. Loaded with three million lines of source code, it presents a wealth of programming language technology that targets developers interested in the internal workings of the Microsoft .net Framework, academics working with advanced compiler technology, and people developing their own CLI implementations. The CLI, at its heart, is an approach to building software that enables code from many independent sources to co-exist and interoperate safely. Shared Source CLI Essentials is a companion guide to Rotor's code. This concise and insightful volume provides a road map for anyone wishing to navigate, understand, or alter the Shared Source CLI code. This book illustrates the design principles used in the CLI standard and discusses the complexities involved when building virtual machines. Included with the book is a CD-ROM that contains all the source code and files. Useful for VB developers of all levels, Programming Microsoft Visual Basic .NET offers a massive and comprehensive guide to the new VB .NET. While concentrating on "traditional" programming techniques brought up to speed with .NET, this book also covers essential Web development, making it a solid choice for those making the leap from VB 6. C# is Microsoft's brand-new object-oriented language for the .NET platform, designed to make it easy for developers to create Web applications. Mastering Visual C# .NET is aimed at experienced C++, Visual Basic, and Java programmers who want a comprehensive resource to Visual C#. It delivers complete coverage of the essentials of the C# language, plus writing Windows and web applications. Topics include using the .NET base class library for basic programming operations like I/O and threads; database programming with ADO.NET; Web programming with ASP.NET; and creating XML Web Services. There is also a chapter on programming security with C#, including permissions and encryption. Author Jason Price has more than ten years' experience in the software industry and has worked with C#, .NET, Java, and Oracle. Coauthor Mike Gunderloy has written numerous books on Microsoft programming topics for Sybex, including ADO and ADO.NET Programming and .NET E-Commerce Programming. The purpose of ASP.NET JumpStart is to show readers the practical applications of .NET and ASP.NET by illustrating how to build Web-based applications using Web Forms and Web Services. Emphasis will be on good programming standards and practices. The reader will be taken from an introduction of the VB .NET language to intermediate topics through a step-by-step approach, which gives the reader the opportunity to try out the practices presented in each chapter. This book is designed to be a complete reference on how to create Custom Server Controls using C#. In essence, it's a definitive guide to what they're used for, how they are created, and the benefits that they can provide. The first part of the book will be concentrating on the code itself, and is designed to be editor-neutral, concentrating on the raw code involved in creating controls and making use of these controls. The second part of the book will have more coverage of visual designers like Visual Studio .NET, talking about why using IDEs is so helpful, and examining the powerful features of Visual Studio .NET that are useful when creating custom controls. A perennial best-selling title for VB Database application, this is a "must buy" for all serious VB developers. The book has been completely updated for the latest release of VB, ActiveX controls, Microsoft's new Internet database technologies, and Microsoft's newest client server technology: Microsoft Transaction Server. The CD features source code and demonstration databases. A hands-on resource for developers, development managers in medium-sized to large MIS development shops, and everyone else who wants to use Visual Basic to tap the power of SQL Server. The enclosed CD-ROM contains sample code from the book, a sample database, code "building blocks" for users' own applications, white papers, and more. Focusing on Visual Basic 6's data-access resources, this is the definitive guide to Microsoft's database development tools. If you're concerned with creating a way for a Visual Basic application or control to talk to an SQL Server back end, this book most likely has the answers you need. Sample of Dan Wasser's chapter on Visualizing Networks for Practice Development and Case Management and how Sentinel Visualizer helps find hidden relationships among people, places and events.